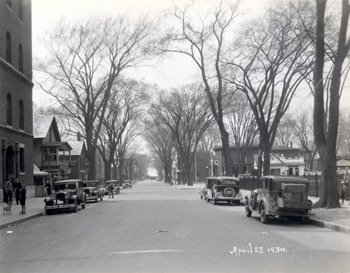 The streetscape of Pearl Street in 1934 contained several buildings and landscape features that characterize the street. One of the most prominent features of the street are the large, upright, vase-shaped, American elms (Ulmus Americana) that line both sides of the street, creating a corridor. 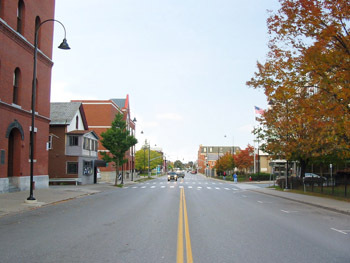 Pearl Street is wide with enough space for two lanes of traffic and on-street parking along both sides of the street. The street appears to be paved in asphalt with a cut stone curb. Several cars are seen parked on the street, and six people can be seen in the view. Along the south side (left) of the street are several small-scale residential buildings with a larger brick commercial building in the foreground. To the north, a decorative cast and wrought iron fence with molded posts and pointed finials marks the edge of the sidewalk and adjacent property line. Also to the north in the background is a gas station with a circular Texaco sign suspended from a pole along Pearl Street. Buildings clearly seen in the photograph include 143 Pearl Street, 135-137 Pearl Street, and 3-5 Elmwood. The large brick 5-1/2 story commercial building on the left side of the image is 143 Pearl Street. Also known as the Masonic Temple building, it was designed by the Wilson Brothers of Philadelphia and constructed in 1897-98 in the Romanesque Revival style(1). Features of the building include a steel post and beam interior, a brick exterior with rounded arch windows and hipped pyramidal roof(2). Sited at the corner of Pearl Street and Church Street the building is divided into five bays of varying sizes that provide retail store frontage along Church Street to the southeast(3). The section shown in the McAllister photograph is the northwest corner of the building marked as 143 Pearl on the 1935 Sanborn map. Four stories are visually divided by narrow light-colored string courses, and windows are evenly spaced and with rounded arch forms, typical of the style. A large arched doorway with scroll-like and floral detailing on the surround marks the main entrance to the upper story Masonic Lodge rooms. In 1931, the building had several tenants including the Vermont Baptist State Convention, Mutual Benefit Life Insurance Company, Oren S. Nims, dentist, Alfred A. Starbied, Mason secretary AASR, and Archie Harriman, Mason grand secretary F&AM(4). In 1942, building was occupied by new tenants including the Colonial Optical Company, W.D. & A.R. Hill Office, Donald E. Beach, accountant, Northern Chemical Service, exterminators, Oren S Nims, dentist, Charles L Hudgins, Mason secretary AASR, and Aaron H Grout, Mason grand secretary F&AM(5). 135-137 Pearl is a two story, frame rectangular building with a gable roof and two story porch, located to the west of the Masonic Temple. A small unreadable sign marks the entrance to the building, which was used as a store during the 1930s. The building also has two smaller rectangular additions to the south, which are not seen in the photograph(6). In 1931, the building was occupied by the Community Fruit Store (135 Pearl), the Majestic Diner (137 Pearl), and offices of the Unitarian Church (137 Pearl)(7). By 1942, 135 Pearl was vacant, and Angelo Sultanos and Angelo’s Café, a restaurant occupied 137 Pearl(8). 3-5 Elmwood is a small light-colored, cross-gabled building with large overhanging pent-like eaves located at the intersection of Pearl Street and Elmwood Avenue. The building serves as a gas station and is built of fireproof construction with three gas tanks to the south. The building was built in the early 1930s, when a large two story frame dwelling was moved from the corner(9). In 1931, Edward’s service station occupied the building, and by 1942, the gas station remained, but had changed its name to George Crocker, gas and oil(10). Back to Depression Era Streetscapes. (2) Sanborn-Perris Map. Burlington, Vermont 1942. (3)Sanborn-Perris Map. Burlington, Vermont 1942. (3) Burlington City Directory, 1931 (Burlington: H. A. Manning Co., 1916-1986). (4) Burlington City Directory, 1942 (Burlington: H. A. Manning Co., 1916-1986). (5) Sanborn-Perris Map. Burlington, Vermont 1926 with 1935 updates. (6) Burlington City Directory, 1931 (Burlington: H. A. Manning Co., 1916-1986). (7) Burlington City Directory, 1942 (Burlington: H. A. Manning Co., 1916-1986). (8) Blow, David. Historic Guide to Burlington Neighborhoods, Vol. 1 (Chittenden County Historical Society, 2003); 185-6. (9) Sanborn-Perris Map. Burlington, Vermont 1926 with 1935 updates. (10) Burlington City Directory, 1931, 1942 (Burlington: H. A. Manning Co., 1916-1986). While some of the buildings located along this section of Pearl Street remain today, significant losses in vegetation create a different street character than present historically. The loss of the American elms that once lined the street has left an open urban landscape. Some deciduous trees have been replanted on the Unitarian Church property to the north (right). Pearl Street retains its original width with two lanes of through traffic with on-street parking to both sides. The decorative iron fence bounding the adjacent church property to the north (right) also remains, but has lost some of its pointed finials and decorative posts. A streetlight fixture is located along the sidewalk to the south of the street. The post of the light curves in a semi-circular form to suspend the bell-shaped fixture. The light is shielded and cast downward to limit light spill and light pollution into the night sky. West of the Masonic Lodge, 135-137 Pearl also remains virtually unchanged from its 1930s appearance. The only immediate difference is the two-story porch, which was enclosed some time during the mid 20th century. In 1972, the building was occupied by the Black Angus Steakhouse(3). In 1984, a gay and lesbian nightclub appropriately called, “135 Pearl” occupied the building(4). In June 2006, the nightclub closed after 22 years of occupying the building; the building now remains vacant. The gas station at 3-5 Elmwood Avenue remained throughout the 1950s, until it was razed to construct a new Federal Building. In 1960 an eight story Federal Building, designed by local architecture firm, Freeman, French, and Freeman, opened to house numerous federal offices including the United States Post Office, which occupies the building today(5). (1) Burlington City Directory, 1972 (Burlington: H. A. Manning Co., 1916-1986). (3) Burlington City Directory, 1972 (Burlington: H. A. Manning Co., 1916-1986). (4) 135 Pearl. http://www.135pearl.com/Upcoming%20Events.htm. June 2006. (5) Blow, David. Historic Guide to Burlington Neighborhoods, Vol. 1 (Chittenden County Historical Society, 2003); 42.